Come and join in the creative fun at one of our flower workshops. Our flower arranging workshops are fun and informal, and a perfect way to create your own floral masterpiece to take home. With expert tuition and all the fresh flowers, foliage and materials you need, whether you’re a complete beginner, a seasoned snipper, or a budding florist, you simply turn up and get creative! Our workshops are held in our own Flower School above our shop in the heart of the pretty village of Lingfield and are suitable for all abilities. All flowers, foliage, materials and refreshments included. Over 18s only. A Luxury Workshop. Learn how to create a stylish and luxurious fresh flower Easter wreath, perfect for your door or as an Easter table centrepiece. All flowers, foliage, materials and refreshments included. 2.00pm to 4.00pm. Suitable for all abilities, from beginners to budding florists. Over 18s only. Booking: Limited Availability - call 01342 836 396 and speak to one of our team to book your place. Join our evening workshop to learn how to make a hat box floral arrangement using beautiful seasonal flowers over a glass of bubbly - a perfect choice for a group of friends! All flowers, foliage, materials and refreshments included. 7.00pm to 9.30pm. Suitable for all abilities. Over 18s only. Available to book as a group for celebrations and hen parties. Booking: call 01342 836 396 and speak to one of our team to book your place. Learn how to make a hand tied bouquet using beautiful seasonal flowers. All flowers, foliage, materials and refreshments included. 10.30am to 1.00pm. Suitable for all abilities from beginners to budding florists . Over 18s only. We also create bespoke workshops just for you; hen parties, birthdays, groups of friends, corporate team building, special events. You can come to us or we’ll come to you with everything you’ll need. Join us to learn all the essentials with plenty of insider tips, and leave full of confidence, inspired and ready to show off your beautiful creation. 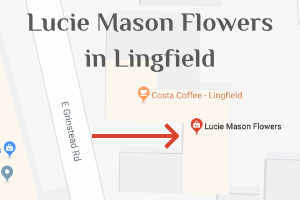 Contact Lucie at Lucie Mason Flowers now to book your flower workshop or to purchase a workshop gift voucher.